One hundred years ago, if you told someone about the Sriracha Quesarito, they would laugh, because nobody back then knew what Sriracha or Quesaritos were... and then they would run you out of town for being a time-traveling weirdo. Even five years ago, though, people would have at least scoffed at the idea. Mexican food with an Asian hot sauce?! Get outta town. Not literally, this time. Fortunately, we live in the present, and the folks at T-Bell have dared to make this hybrid superfood (we’re using that correctly, right? “Superfood?”). So I tasted it. Here’s what I discovered. Taco Bell purports that the Sriracha Quesarito is filled with your choice of meat (chicken, in this case), “premium Latin rice, our own tangy Sriracha sauce, and reduced-fat sour cream.” So it’s not the Huy Fong stuff to which we’re all accustomed. They’re keeping mum about what exactly goes into the sauce (which T-Bell claims is currently their spiciest), but it is significantly creamier, less garlicky, and more orange than Rooster Sauce. There's sauce in the main area of the Quesarito, but there's another, smaller layer mixed into the cheese quesadilla shell, which makes for a kind of Thai-inspired nacho sauce. 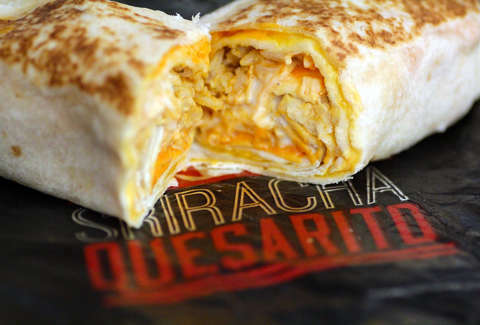 Unwrapping the special black “SRIRACHA QUESARITO” foil reveals a lightly grilled burrito. 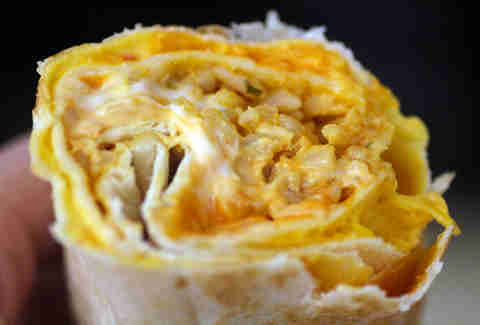 As with a typical non-Sriracha-ed Quesarito, the warm quesadilla shell contains gooey neon-orange cheese, which is quickly outclassed (at least in orangeness) by the Sriracha sauce, which -- as they said -- is tangy and subtly sugary, but also definitely not lacking a certain type of Asian-inspired heat. There’s a lot of the sauce in here, which is definitely not a bad thing, per se. It’s spicy, and the unique formula they use jives with the meat, rice, and cheese in a way that regular Huy Fong Sriracha probably wouldn’t. Also, it isn’t crazily salty! Wow! While I wouldn’t call the flavors here nuanced, there is a harmony achieved between the (thin, but not too thin) layer of cheese and the generous helping of Sriracha sauce. Granted, everything else takes a back seat, but with those two driving the minivan, this is one family road trip I’ll actively try not to sabotage. Taco Bell’s Sriracha sauce is featured in a lot of other menu items now (you can get it on just about anything), but I think that it’s really met its match in the Quesarito. In any other case, the amount of this condiment that T-Bell employees are instructed to use would be overwhelming, but with the bold levels of cheese and starch already present in the Quesarito, it balances out quite nicely. If you’re into Taco Bell and Sriracha (hello, millennial market! ), this is definitely worth a try. It didn't pioneer the hybrid fast-food game, but it's definitely one of the best players. 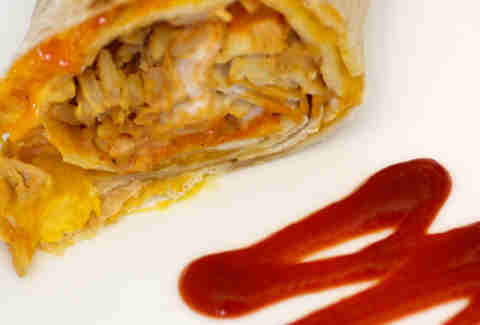 Adam Lapetina is a Food/Drink staff writer at Thrillist, and this Sriracha Quesarito is makin' him thirsty. Read his musings at @adamlapetina.